The year is 1999. The world is caught in the grip of Y2K fever and fears of the apocalypse. 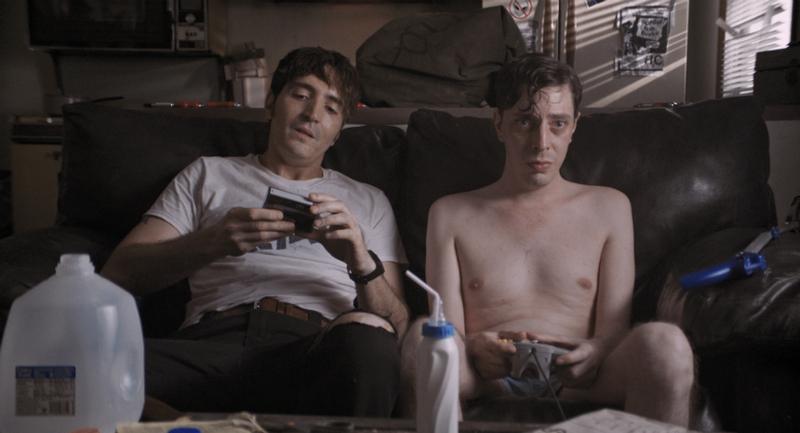 A shut-in named Abbie (Joshua Burge) and his mean brother Cam (David Dastmalchian) live in a squalid apartment lined with graffiti, punk rock flyers and trash. The brothers engage in various dumb "challenges" in order to test each other's will. After Abbie fails a particularly sickening challenge, Cam, who seems to have modeled his life after Lee Ving, lays down the gauntlet: Abbie can't leave the couch until he beats the "glitch" level on the Pac-Man video game. Abbie's situation gets increasingly stranger and desperate once the challenge starts. Relaxer takes place solely within the confines of a small apartment. Various characters, including a quasi-Juggalo dirtbag (Andre Hyland) and a former co-worker (Adina Howard), come to visit. No matter what happens or who drops by, Abbie never leaves the filthy couch. The camera slowly moves throughout the tiny space. Numerous panning shots, closeups and zooms are used to hide and reveal details. After awhile, Relaxer takes on an immersive quality that leaves the audience feeling as if they are trapped in a bug-infested dump with a lot of unpleasant people. This immersive effect heightens the impact of the film's many comedic moments, which range from deadpan jokes, crazy monologues about Jerry McGuire and gross-out sight gags. Review originally published during SXSW in March 2018. The film will open in select U.S. theaters on Friday, March 22, 2019.